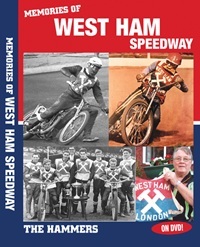 It's been forty years since the last lap was completed at Custom House - the home of West Ham speedway. This new DVD turns back the clock to breathe new life into the memory of this grand old club. Produced by Retro-Speedway, the two DVD box-set runs to over four hours and mixes vintage footage, classic photographs and modern interviews . The DVD benefits greatly from John Chaplin's contributions. The speedway historian demonstrates a remarkable knowledge of the events and riders of the pre-war era. We learn about the likes of Bluey Wilkinson, Tommy Croombs, Colin Watson and Tiger Stevenson. A historian chatting about riders from the distant past could make for dull viewing, but Chaplin's style of delivery and his enthusiasm for the subject ensure this isn't the case. Len Silver is another lively contributor. 'Leaping Len' rode in the West Ham second halves at the start of his career and recalls the day he found an additional pound on his payslip marked as 'F.O.M'. The baffled youngster queried the extra payment and was told it was 'Falling Off Money', in recognition of a particular impressive tumble. No prizes for guessing that one Johnnie Hoskins was managing the pay roll at that time! Len is also well placed to comment on the promotional style of those running the club in those days, admitting that it influenced his own approach when he moved into management. The post-war era saw Jack Young join the Hammers as reigning World Champion. He retained the title in his first year with the club and Dingle Brown speaks fondly about the man and his talents. Interestingly, Dingle reveals that Jack's real passion was for fishing and that speedway was very much a career rather than a passion. Norman Hunter, Bengt Jansson, Tony Clarke, Olle Nygren and Malcolm Simmons are other riders interviewed about their time with the club. Hunter is interviewed at length and the treble winning season of 1965 is one of the key topics of conversation. Robert J. Rogers, a regular contributor to this very site, represent the fans' views and speaks warmly about so many happy nights at Custom House. Still proudly wearing his Hammers' scarf, his passion for the club is obvious and he offers a different perspective on the final years of the club's history. Good use is made of the available archive footage - a mixture of newsreel clips and cine film primarily. This ranges from the very early days to the final meeting staged at the track. It's a pity that more isn't available but that's simply symptomatic of the media's disinterest in the sport in the sixties. The history of West Ham speedway includes some tragic events - the deaths of Dave Wills and Tad Teodorowicz through track crashes and the Lokeren road disaster of 1970. The DVD covers all these terrible events and includes archive video that shows Colin Pratt and Stan Stevens return to Lokeren. The title of this DVD is very apt, it's not a definitive history of the club, much more a meandering stroll through the memories of those who remember the Hammers. If you're looking for details of league placings or meeting results then you'll not find them here. If you'd rather hear about the riders, the big events and the human stories then this fits the bill perfectly. "I have to say that, for me as a former Hammers supporter, this DVD is a great trip down memory lane. It's very well produced. I didn't time it but there seemed to be about 3 hours worth. The contributors really took me back, not only to my times at Custom House in the sixties, but made me feel close to the 30's and 50's times too. I have always wished that I had seen Aub Lawson ride, just missing his days at Norwich. I can now see him on this DVD (actually two DVDs). I suspect that this DVD will appeal to a wider audience than Hammers folk - I hope so as it deserves to.I have the recent Rayleigh DVD also (I supported them in the Len Silver years). I couldn't put a price on memories they have brought back. I recommend them to all readers.."